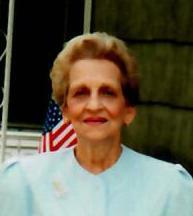 Obituary for Constance D. (Pantano) Cassanese | Meek & Dalla Valle Funeral Home, Inc.
Cassanese, Constance “Connie,” 97, Johnstown, formerly of Windber, passed away March 24, 2019 at the Atrium Manor. Born March 3, 1922 in Johnstown. Daughter of Anthony, Sr. and Anna Mary (Distefano) Pantano. Preceded in death by parents, husband Eugene, Sr., son George and siblings Alvira Burkhard, Ida Koscienski, Mary Colegrove, James Pantano and Anthony Pantano, Jr. Survived by sons Joseph M., Davidsville and Eugene Jr., and wife Patty, Johnstown. Grandchildren Stephanie Ashbrook and Heather Chernicky, both of Johnstown. Great-grandchildren Zachary and Katlyn Glessner and Conner Chernicky. Also special niece Rosie of Flordia. Connie was a volunteer at the Former Windber Medical Center for over 30 years. She deeply loved that work, her friends and her departed special son “George.” The family will receive friends from 5 to 8 pm Wednesday at Meek & Dalla Valle Funeral Home Inc., Windber, where funeral will be held at 10 am Thursday. Fr. Larry Lacovic, officiating. Committal St. Anthony’s Cemetery, Windber. In lieu of flowers memorial contributions may be made to Interim Healthcare or Atrium Manor, Johnstown in memory of Connie.